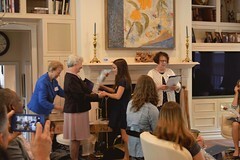 The Scholarship Committee consisted of Beverly Kestenis (Chair), Danuta Buzdygan, Janet Reiche, and Alyce Conlon. 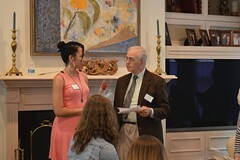 We interviewed four students from Hun, six from Princeton Day School, fourteen from Princeton High School, and seven from Stuart for a total of 31 interviews. 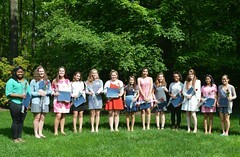 The Florence Bell Hillier Award went to Emma Brigaud of Stuart; the Updike Award to Adria Backus of Princeton High School; the Harriet Peterson Award to Amy Hauer of Princeton, and the Ramona Peyton Award to Eris Gee of Princeton Day School. 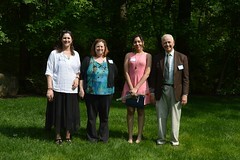 This year’s special 100th Anniversary Award of $3,000 went to Amanda Douglas of Hun. 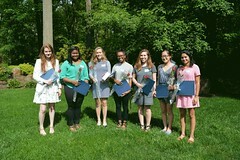 The Women’s College Club Scholarships of $2,000 each were awarded to Amy Guan, Denise Spivey, Emily Swedish, Kellington Swedish (all from Princeton High School); Jamie Maher of Princeton Day School, and Harley Guzman of Stuart. 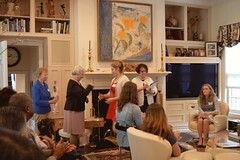 To mark our 100th anniversary four special Merit Awards of $1,000 each were given to candidates who had not received the Hillier Award but were worthy of another award. 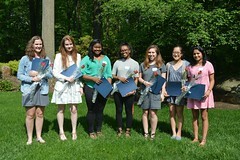 These included: Marie-Louise James and Nikhita Salgame both of Princeton High school; Rebecca Chanin of Hun, and Catherine Donahue of Stuart. 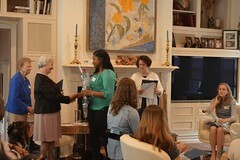 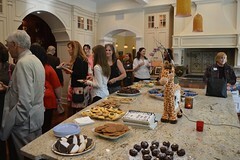 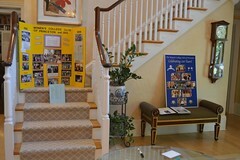 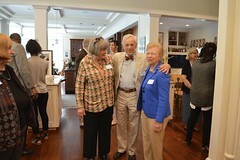 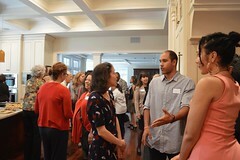 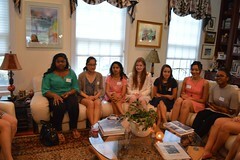 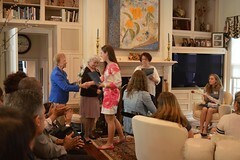 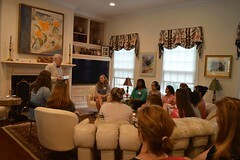 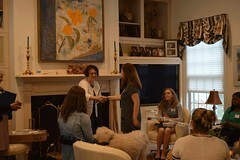 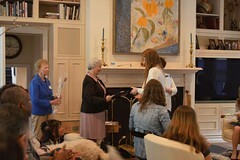 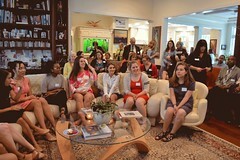 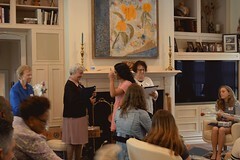 The scholarships and awards were presented to the recipients at an Awards Tea held on May 24 at the home of Ginny Mason. 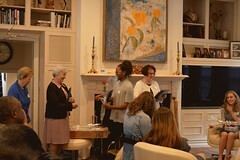 Bob Hillier presented the Florence Bell Hillier Award to Emma Brigaud and Murray Peyton, who attended along with his daughters Catherine Clowes and Diana Kollevoll, presented the Ramona Peyton award to Eris Gee. 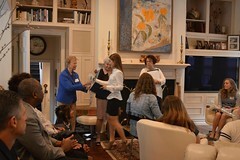 Also present were parents and friends of the scholarship recipients, Sarah Graham of Princeton Day School, Robyn Henry of Stuart, and Beth Ann Burkmar of Hun as well as members of the Women’s College Club. 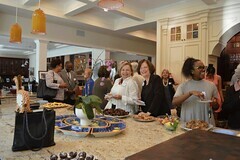 Members of the Club provided refreshments and Nora Ananos was the official photographer. 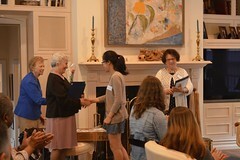 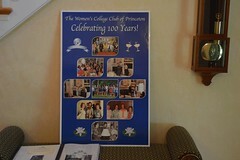 Certificates were provided by Rosemary Barratt of The Women’s College Club. 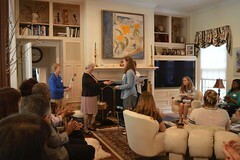 The total amount of awards given was $28,500. 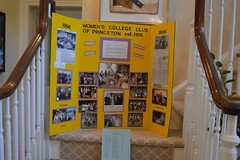 This entry was posted on June 8, 2016 by The Women's College Club of Princeton, NJ in Uncategorized.